It’s that time of year again—the holiday season! And as well all know, the season brings with it lots of swirling emotions, often two of them are joy and stress. Regardless of the holiday you celebrate, gifts are often a part of the equation, they give us joy to give and receive, but the process of choosing the right one for your sweetie can cause lots of stress. Don’t fret, I am here again offering some ideas for you in this 2016 edition! As someone who is all about quality time (yep, you guessed it, it’s my love language! ), I still and always will adore the idea behind presence as a present. I wrote about this concept a couple years ago and gave some stellar suggestions on gifting your presence, you can read it here. If you would prefer to give a gift, I created a list of my top three gifts for lovers for Denver Natural Mom two years ago—they’re sure to spice things up. Access the list here. And last year, I compiled even more swoon-worthy gift ideas that you can see here. For this 2016 edition, I would love to share a connection inspiring idea I read in a FB thread. A woman had shared a tradition she has continued for the past few years. She pre-plans and pre-pays dates for the entire year complete with 12 envelopes that her husband opens each month. Wowza! I was blown away with this fabulous idea—talk about no excuses for prioritizing dates with your sweetie! She had asked for some ideas because they are expecting and their lives will greatly change, yet she wanted to continue to make this tradition happen and nourish their relationship. 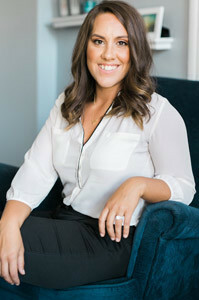 Certainly, as a therapist who works with couples in connecting emotionally, sensually, and intimately, this made my heart sing while also giving me inspiration to do the same as my husband and I too approach the birth of our first baby. *Unbox Love: it can be hard to think outside the box when it comes to date nights. The solution? Join Unbox Love for their creative, monthly dates delivered to your door. Everything you need is included AND these can be done at home so no more worrying about babysitters. (NOTE: I mentioned this in the lovers gift guide and because I love it so much, it’s worth mentioning twice to ensure you see it). *Star Gazing: grab a blanket, your favorite warm drink, and each other. Head outside and stargaze wrapped up in each other’s arms. There are even apps where you can aim your phone or iPad up at the sky and it’ll tell you what stars and constellations you are looking at. *Take a bath or hot shower together taking turns washing one another’s body. Then be sure to wrap each other up in a warm, cozy towel spending the rest of your time talking and connecting. Soak up the sensual and loving experience of being washed and cared for. *Create a playlist of your songs and invite your beloved to dance the night away. I encourage you to create a mix of genres and tempos as to indulge in all kinds of dance and touch together. You can of course pre-pay (or add into your monthly budget) and pre-plan dates that take you away from home too. Allow this list to inspire you to create your own tradition. 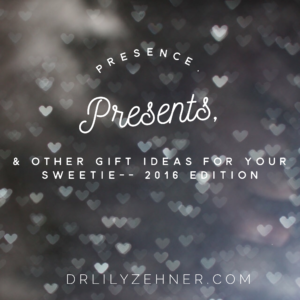 So, whether you choose to gift presence, a present, or create a tradition of dates (at home or elsewhere), I hope it creates opportunities of play, warmth, and deepening your connection.